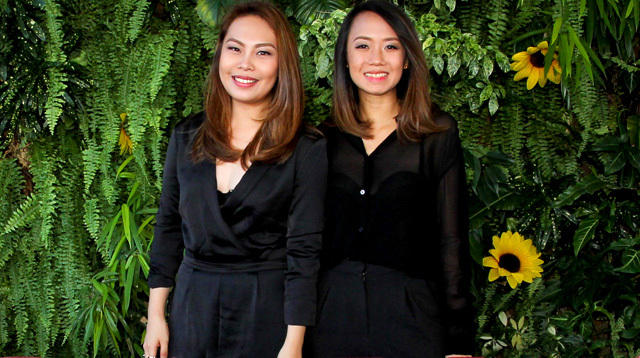 Maita Baello and Cath Sobrevega had NO CLUE they were going to do this for a living. But they found the job opening on Twitter, and life hasn't been the same since. Celebrity stylist and former fashion editor Pam Quinones tweeted that she was looking for new assistants, and that interested applicants should send their resumes to her email. Maita Baello—who was then in Marketing—and Cath Sobrevega—a fresh college graduate—were two of the many girls who took their chances and sent their CVs to Pam. “One day I got a text from Pam saying, ‘Are you free today? I need you to pick up a gown and bring it to this hotel. Bring your styling kit. Consider this your interview.’ So I rushed to National Bookstore and built my kit,” shared Cath at Cosmo's first Fun Fearless Life event on June 6. “People think it’s a fabulous job,” said Cath, “But it’s actually a very physical job!” A typical day for the girls involves a lot of steaming, pulling out, and altering clothes for their clients. But even if their work is demanding, both girls agree that they absolutely love the fact that every day is different. “One day you’re pulling out clothes, the next day you’re in a meeting, then you’re at a shoot. It’s never the same thing,” said Maita. According to Maita and Cath, if you want to succeed in the industry, you should possess three important characteristics. First, you must have an eye for fashion and know what looks good and what doesn't. Second, you have to LOVE fashion, because it's your job to know the latest trends. Lastly, know when to trust your gut when styling. The girls also point out that in this industry, you have to be resourceful, hardworking, and yes—nice! So what’s their biggest advice for girls who want to be stylists like them? “Intern or assist. There is no shortcut—experience is the best teacher,” said Maita. Maita Baello and Cath Sobrevega were two of the speakers during Cosmo's first Fun Fearless Life event. Get That Life: How I Started Joining Marathons In My 30s Because Why Not?